And what the hell is Bill Cosby doing wearing Weird Harold's hat?" This week's review subject, "Let's Do It Again", is a perfect example of trying to go in too many directions at once, with the end result being that you end up absolutely nowhere. With the presence of Bill Cosby and Jimmie "J.J." Walker, obviously, this is supposed to be a comedy. Cosby was already a comedic giant at this point, and a movie/TV star in his own right. 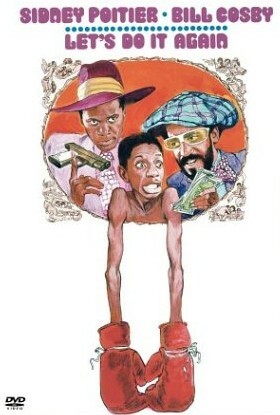 And Walker, the undeniable star of the TV hit "Good Times", was about as hot a comic commodity as there was circa 1975. The fact that these 2 are coupled with (and directed by) one of the most respected and beloved movie stars of all time in Sidney Poitier in this film should have made it a sure-fire classic. So what happened? After the obligatory-for-a-70's-feature "movie title-inspired song" (given the minimal amount of nookie in this PG-rated movie, it's a deceivingly sexual tune by The Staple Singers. The "It" that they're singing about certainly isn't the "It" that our protagonists have decided to "Do Again"! ), we get down to our equally deceivingly simple plot: Billy Foster (Cosby) and Clyde Williams (Poitier) are a couple of blue collar married guys who, along with their wives, belong to a fictional order known as the Brothers and Sisters of Shaka (which seems to be taking pokes at both the Nation of Islam and the Shriners). The Elder Statesman of the group (Ossie Davis) is the bearer of bad news; the group is going to be losing their lease soon, and they don't have the funds available to relocate or rebuild. So Billy and Clyde hatch a scheme to get the money for their brothers and sisters. The plan involves rigging a boxing match between the middleweight champ, the prosaically named 40th Street Black (Rodolphus Lee Hayden) and a walking stringbean named Bootney Farnsworth ("KID!<clap!>DYN-O-MITE!"). How are they going to do it? Turns out Clyde is the greatest hypnotist of all time, and they're going to hypnotize Bootney into believing that he's an unstoppable fighting machine. Then they're going to take the fraternal orders' savings and make two enormous bets on the long odds challenger with the two biggest bookies in town, the hard-as-nails gangster Kansas City Mack (John Amos, J.J.'s co-star on "Good Times") and the super-suave Biggie Smalls (played by the fantastic Calvin Lockhart. If you can't picture him B-movie fans, think back to "Predator 2" and recite the line "Dey say he from de udda side" with a Jamaican accent). And with some slight detours aside, the plan comes off and the brothers and sisters of Shaka get a new building. That is, until one of the gangsters figures out Clyde and Billy's scheme and tracks them down. Will they "Do It Again" in order to save their necks? You bet your Jello pudding pops they do! The whole thing sounds like a ridiculous premise, and after watching the entire film, it doesn't disappoint. It's UTTERLY ridiculous. Poitier and Cosby get pretty much ALL of the comedic moments, most of them consisting of Clyde trying to keep up with the rapid-fire riffing and blathering of Billy. Truthfully, it's kind of hit or miss. I know it's supposed to be comedy, but it was kind of hard to believe that ANYONE would be tricked by Billy's nonsensical rants. There's an obvious attempt to poke fun at the blaxploitation films of the era. Clyde and Billy place their bets in disguise, wearing the most pimp-like threads they can find (Clyde's outfit looks like it was taken directly from the "Superfly" wardrobe department). The rest of the comedy veers towards cartoonish, particularly Clyde's ability to hypnotize his targets from a variety of positions, all of them taking less than 15 seconds. And I got the feeling that the visual of "J.J." from "Good Times" in boxing trunks was comic gold in the minds of the writers and the casting director. Unfortunately, they didn't give him anything really funny to do. After seeing so little of Walker in the movie (with his appearances being little more than mugging with minimal wit), it kind of feels like his prominent inclusion in the credits and on the movie poster was more of a marketing ploy, rather than a celebration of his comedic talents. Given the borderline slapstick elements presented here, I was stunned by the decision to have the two antagonists play it pretty much straight. John Amos as Kansas City Mack was a little too volatile to be laughed at in most scenes. And Calvin Lockhart's stoic face DEFIES you to laugh at it! Go ahead! Try and laugh at him! The time spent with these two obviously hardened criminals seemed like an attempt to set up some sort of crime caper atmosphere. But it was lost in the relentlessly goofy antics of the 2 leads. The finale was a particularly stark example of a poor mixing of genres. A chase scene right out of "Serpico" is punctuated with a groan-inducing ending (you can almost hear the "wop-wop-WAAAA!" of the trumpet when all's said and done). The result is a number of humorless lulls during the 110 minute running time. The cameo appearance of George Foreman as a construction worker at the beginning of the movie was, unfortunately, the high water mark for this one. I've mentioned the impact of "J.J." in boxing trunks. I'll give the filmmakers the benefit of the doubt and say this was MEANT to be patently ridiculous. But their choice of the inert Rodolphus Lee Hayden to play the Middleweight Champion of the World is extremely puzzling. I don't think I've ever seen a less charismatic human being. He makes Tom Carvel look like Michael Buffer. And I can't find any evidence of Rodolphus being a boxer at the time. Maybe Carlos Monzon wasn't available for filming, by why not give someone else a call to play the champ? I'll bet Marvelous Marvin Hagler would have jumped at the chance! Even putting my problems with the casting choices aside, I couldn't see any evidence of fight choreography. The fact that they DIDN'T have some sort of physical tick or goofy fighting style for Bootney showed a complete lack of comedic understanding. What's the sense of putting someone of Walker's dimensions in the ring and THEN trying to pass him off as a REAL boxer? "Let's Do It Again" was the middle of three comedic collaborations between Poitier and Cosby during the mid-70's. I've never seen their final movie "A Piece of the Action", and my memories of "Uptown Saturday Night" are hazy at best. But from the other reviews that I've read, this one was their least dramatic attempt. Unfortunately, I think that was their undoing. They should have gone all the way, one way or the other. This just ended up as a muddled mess. The closest I can come to recommending the movie is to say this: if you've ever wanted to see Bill Cosby talk dirty, this is about as close as you're gonna come. There's a scene where he's flirting with his wife, and... well... all I'll say is that the dialogue contains the word "crevice". It was a chilling moment.